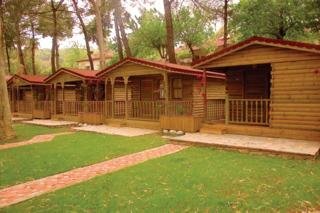 This well established beach hotel consists of a total of 128 individually named blocks of rooms set in lush gardens with towering pine trees. 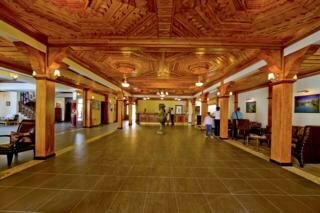 The large impressive lobby has an attractive wooden carved ceiling and decorative wood is prominent throughout as a feature. There is a relaxing and tranquil environment and facilities on offer to guests at this air-conditioned establishment include a lobby area with a 24-hour reception and check-out service, a hotel safe and a currency exchange facility. 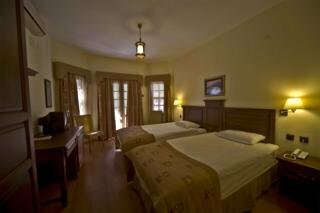 The younger guests are offered a children''s playground and there is a bar, a restaurant and WLAN Internet access. Guests can also take advantage of the room and laundry services (charges apply to both) and it is possible hire bicycles on the premises (charges apply). 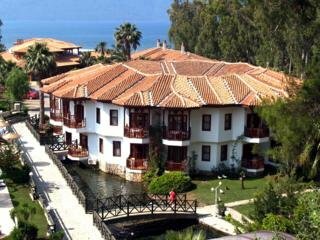 This hotel is located in a unique spot by the water''s edge in Gokova Bay, an area well known for its natural beauty. Guests will find restaurants, bars and shops 300 m away. Public transport is a few minutes'' walk away, in the centre of Akyaka and offers guests connections to Mugla (25 km), Marmaris (35 km) and other towns in the area. 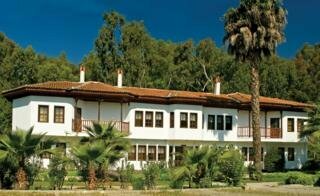 The Dalyan Mud Baths are 80 km away and it is 65 km to Dalaman Airport. This well established beach hotel consists of a total of 128 individually named blocks of rooms set in lush gardens with towering pine trees. The large impressive lobby has an attractive wooden carved ceiling and decorative wood is prominent throughout as a feature. There is a relaxing and tranquil environment and facilities on offer to guests at this air-conditioned establishment include a lobby area with a 24-hour reception and check-out service, a hotel safe and a currency exchange facility. The younger guests are offered a children's playground and there is a bar, a restaurant and WLAN Internet access. Guests can also take advantage of the room and laundry services (charges apply to both) and it is possible hire bicycles on the premises (charges apply). During the winter months and low season (April and October) some advertised facilities may not be available.